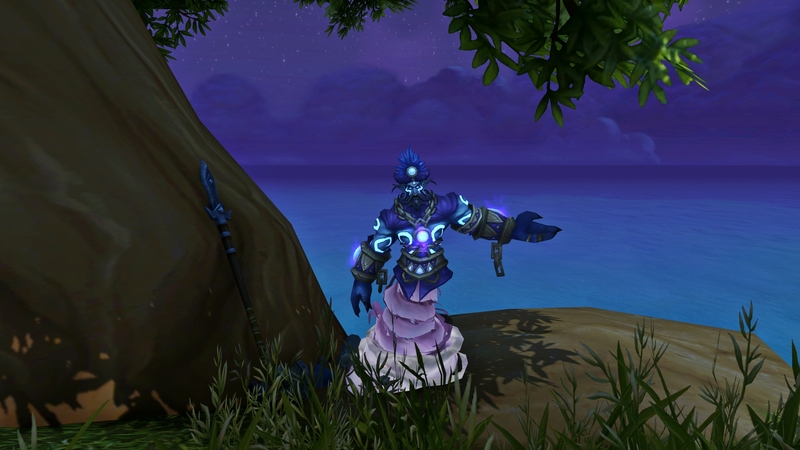 This post was written in August before I race changed to Highmountain tauren and before Battle for Azeroth was released, but I forgot to publish it cause there was so much going on. I read about the Postmaster’s questline a while ago. 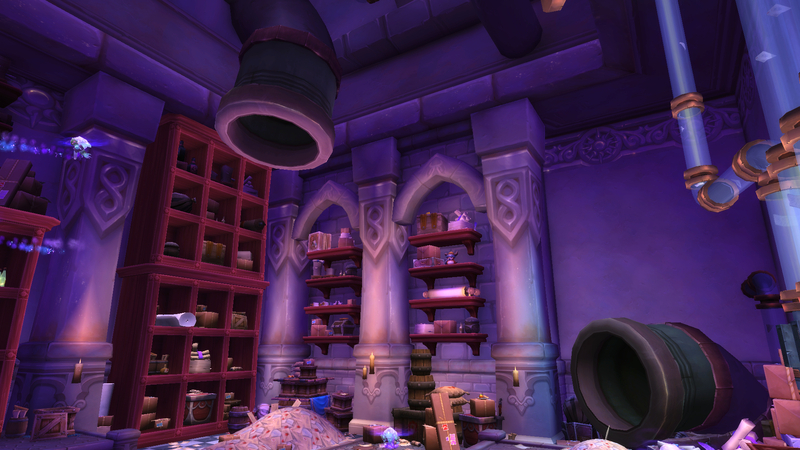 It starts when you find a lost letter by a mailbox in Dalaran and takes you through a questline where you learn more about how the mail works in Azeroth. 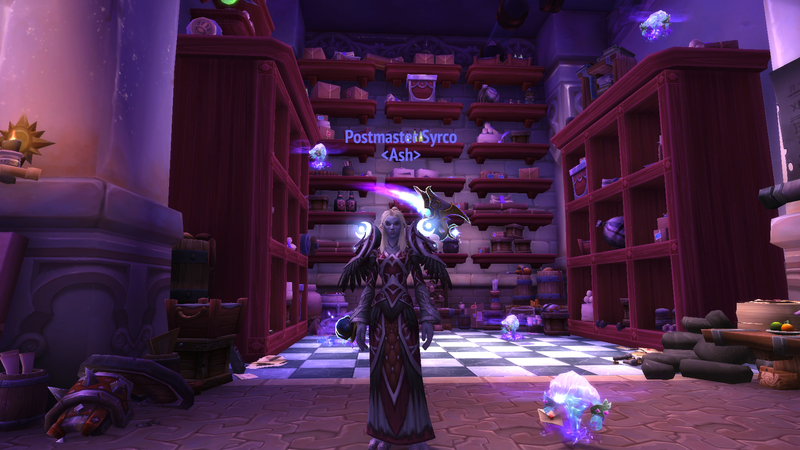 You get to help the Postmaster and have to sort letters correctly and fast enough. I thought it looked like a lot of fun cause Iike to think that I’m pretty decent at zones and locations. I thought I’d start looking for the Lost Mail. But I thought it would take me days to get one and was surprised when I found one the same day. The quests are fun so you should read the quest description and dialogue between the NPCs. Wowhead has a helpful guide you can follow if needed and there is a Weak Aura you can use to make it easier to sort letters for the achievements. 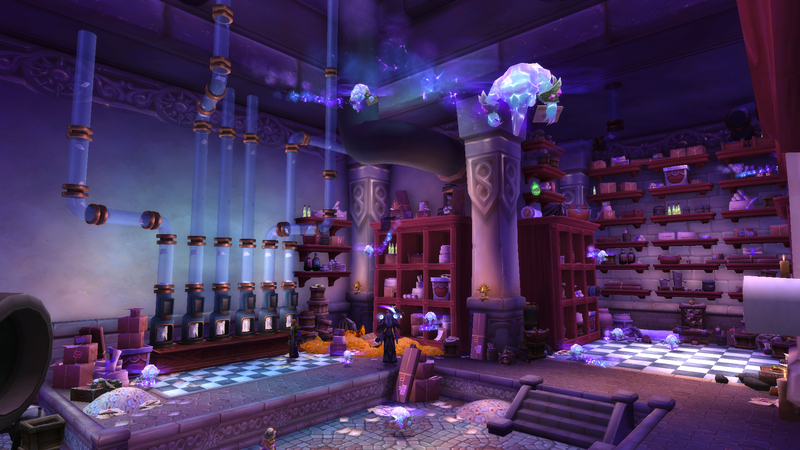 I’ve always loved exploring, discovering secrets and solving riddles, but I haven’t been up to date on all of the Legion secrets. I didn’t know about the Lucid Nightmare mount until very recently, but I like the model and I’ve been hoping to get the Wild Dreamrunner from Val’sharah. 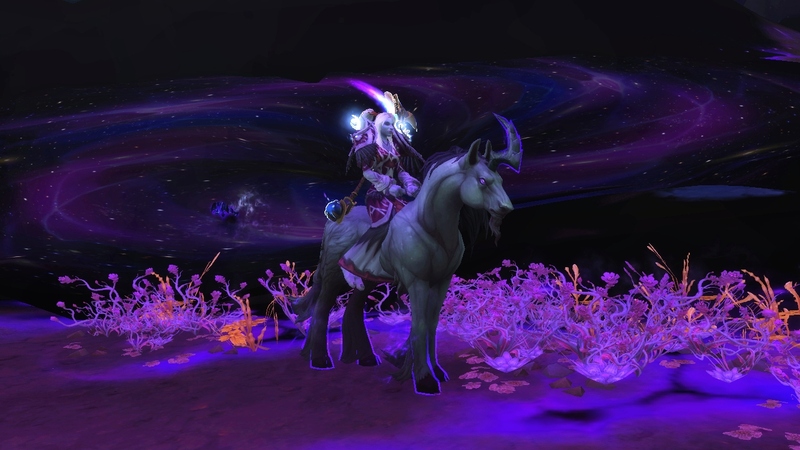 Then I read about the Lucid Nightmare mount which looks much cooler and I love that you have to complete a series of challenges to obtain it. I heard it was supposed to be very hard and would take at least 3-4 hours if you were lucky. So I found a guide and skimmed through it because I thought this one would be way too hard to solve all alone, remembering how difficult some of the clues to the Riddler’s Mind-Worm were. It seemed straightforward and not too hard, so I went for it. Some of the clues were easy, but most weren’t, so I’m glad I had the guide to follow. The mini games were fun, some a bit time-consuming, but I didn’t have any problems. Then I got to the Endless Halls, a very confusing maze. I read about it and decided to use the Lucid Nightmare Helper addon to try to keep track of the rooms, but it didn’t help that much because I didn’t manage to figure out exactly when I got too far out on one side and ended up on the other side. But I tried to keep track of the orbs I found and it didn’t take me too long to finish the first four, but then I got stuck on the last one for at least an hour until I finally found it. It took me almost four hours, that includes traveling and going back for something I had forgotten. Do you have the Lucid Nightmare mount? What are your thoughts on the challenge? 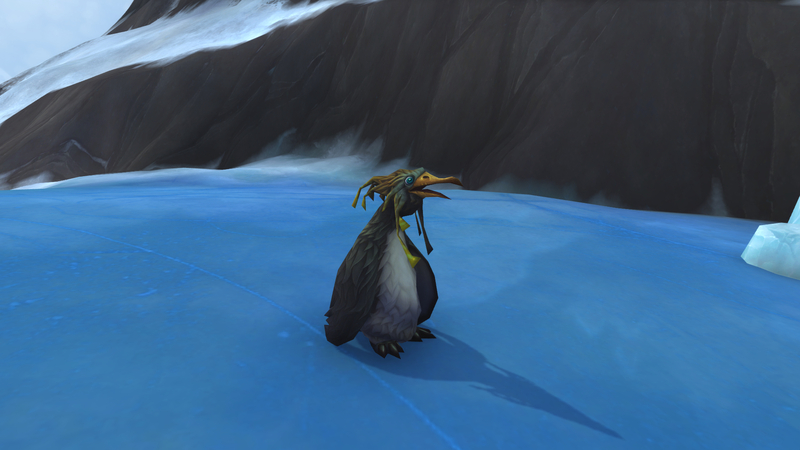 I was exploring Tiragarde Sound when I came across the Pengling Sledding Champion on a mountain near Bridgeport and Kennings Lodge. He lets you ride on his back and race down the glacier from a speeding yeti. I couldn’t find a video of it, so I made one. 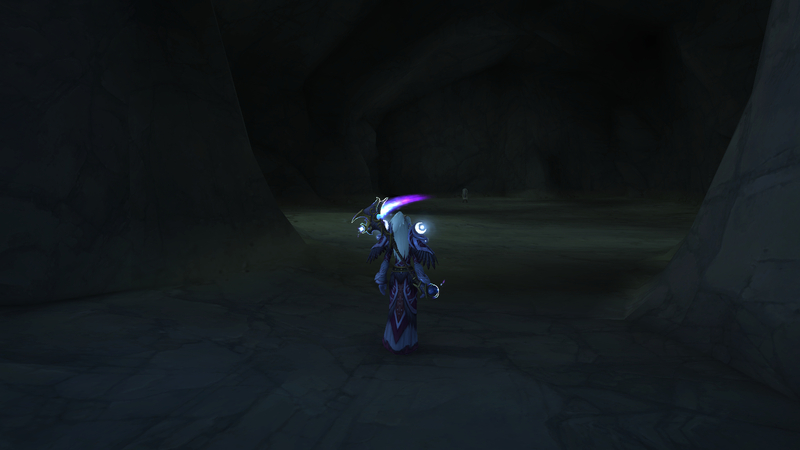 It is part of the world quest Slippery Slopes on level 120 if the limited info on Wowhead is correct. 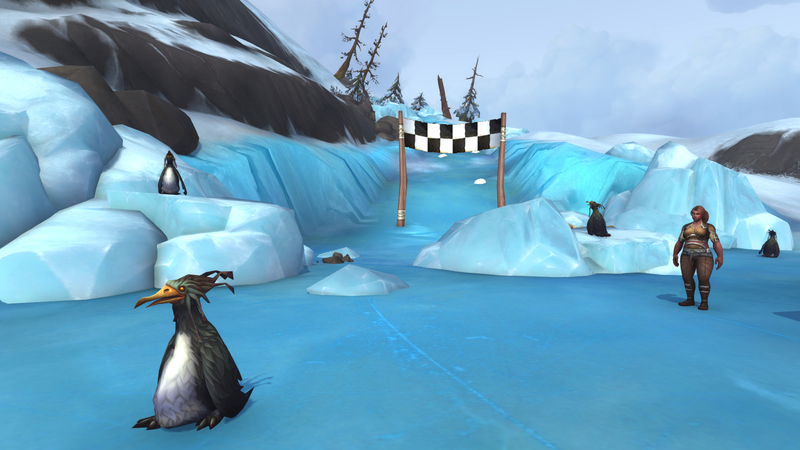 This reminds me so much of the penguin race in Super Mario 64 which I played a lot back in 1997, I just wish this race was longer cause it’s so fun but too short. I also discovered this goat with a paintbrush in his mouth. His canvas is still blank, so he hasn’t painted anything yet. I tried sitting on the stool next to him, hoping he would paint me, but sadly nothing happened. Have you discovered anything fun in Battle for Azeroth? 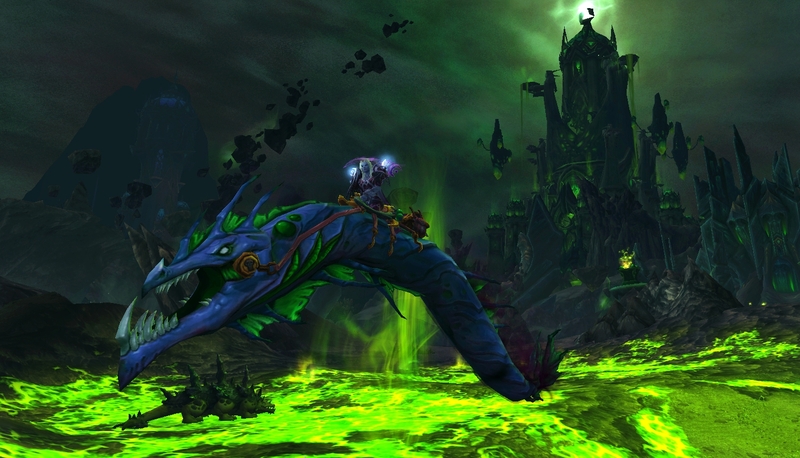 A few days ago a friend told me about this mount, Riddler’s Mind-Worm, that was in the game but none really knew how to get it. 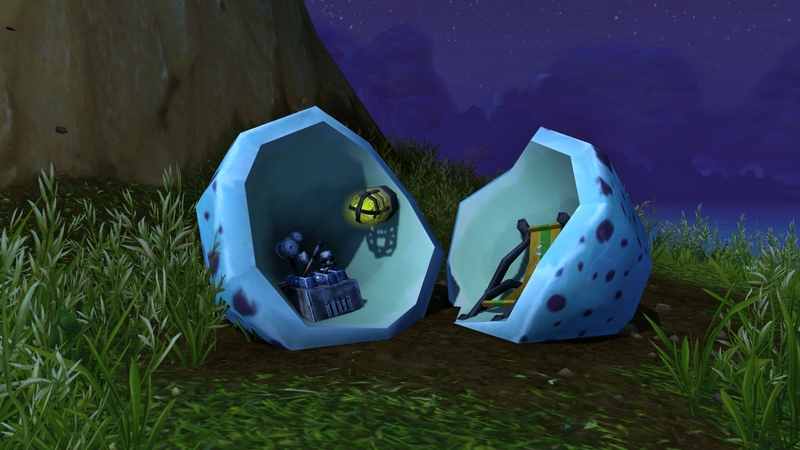 He said there might be clues for it around in the world and that a group called the Secret Finding Discord Community was actively looking for these clues. 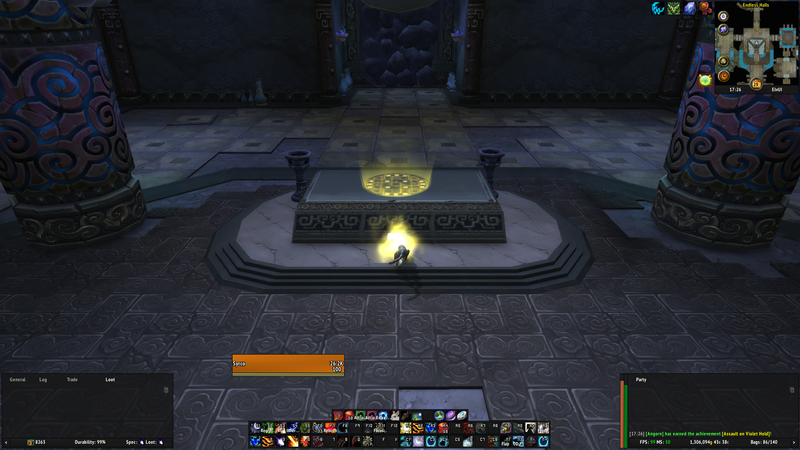 Someone found a page called Page 9 in Dalaran that read “…of sea, spirit and self…” but none knew where to look next. This group searched all over the world for the next clue which would finally lead to the mount. I love to explore, find secrets and solve riddles, so I would have loved to join them, but I didn’t have time to run around and look for clues. It was really exciting to follow their progress last night and read what the next clue was and then discover what it meant. It might just be me, but I don’t understand how the clues could have led them to those specific locations, because I don’t see how it’s logic. I get that the clue “…first of lords to fall…” means Ragnaros, but some of the others I don’t get at all. Maybe it helps to have read the book, World of Warcraft: Chronicle Volume 1, which the clues are inspired by. After I heard that the rest of the clues were solved and the mount was found, I went to collect the rest of the pages and obtain the mount for myself. Thanks to Nightswifty’s guide on how to get the Riddler’s Mind-Worm and the Secret Finding Discord Community who solved the puzzle! To top it all off: I finally hit revered with the Armies of Legionfall today and can now fly on the Broken Isles! I was so close yesterday and just needed a few more quests to get enough reputation. I understand why Blizzard kept us waiting this long and I’m fine with it, but I feel like I’ve spent enough time running around on the ground, being dazed a thousand times, getting stuck places and dying. It’s so great to finally be able to fly again! Did you solve any of the clues and get your Riddler’s Mind-Worm? 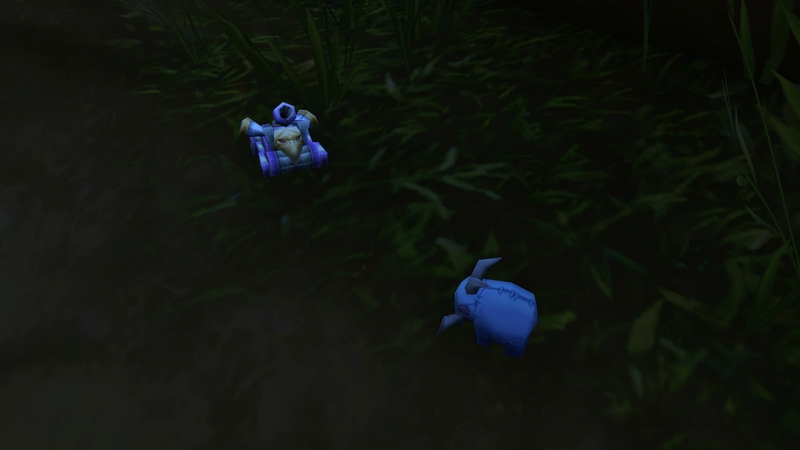 Blizzard created an island and an NPC to honor Robin Williams who passed away in August 2014. 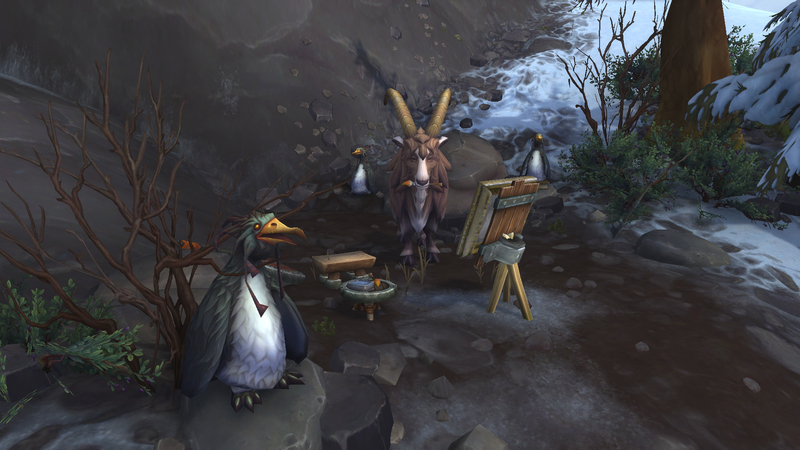 The NPC, Robin, can be found on an island off the coast of Nagrand and Talador in Draenor. He can be summoned by clicking the Ever-Burning Lamp and he will yell “PHENOMENAL COSMIC POWERS! Itty bitty living space” which is a reference to Robin Williams’ role as Genie in Disney’s Aladdin. Other references can be found around the island. Like the large egg with a chair and some machinery inside which is a reference to his role as Mork the alien who comes to Earth in an egg-like spaceship in the TV series Mork & Mindy. Some toys can be found behind a tree, which I read is a reference to the movie Toys. A murloc riding an elekk can be found higher up on the island. Together with a cage and bones. I don’t know what these items are references to, maybe Jumanji and Night at the Museum? Have you visited Robin on his island?